Jeremy Lane had the worst Super Bowl experience. 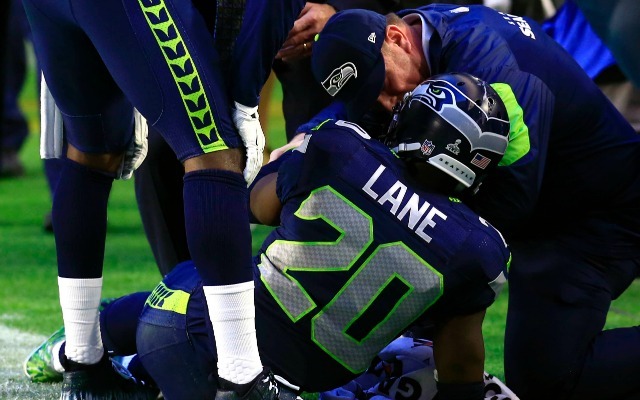 The Super Bowl couldn't have started any better for Seahawks cornerback Jeremy Lane. But it went tragically wrong in a hurry. In the first quarter, Lane intercepted Tom Brady in the red zone, but that ended up being the last play of Lane's game. On the return, he injured his arm, forcing him to miss the remainder of the Super Bowl, which ended with Russell Wilson's pick on the 1-yard line. On Wednesday, Lane recounted his Super Bowl experience for reporters. It is, without a doubt, one of the worst Super Bowl stories. Apparently, Lane had surgery during the game. He woke up from the surgery at the worst possible time. Because of having arm surgery during it, Jeremy Lane said he didn't know until the day after that #Seahawks lost the Super Bowl. Then, Lane found out a month after the Super Bowl that he also tore his ACL. It gets worse. Lane also dealt with an infection in his arm, which forced him to undergo another surgery in the spring. Finally, some good news: Lane practiced this week for the first time this season and could contribute to the Seahawks' playoff run down the stretch.